At 6’3” and 210 pounds, George Washington was a muscular and athletic man who dominated every room he entered. He was a natural leader, and for the last 45 years of his life he found himself at the center of almost every significant event leading to the creation of a new nation — a nation proclaiming a belief in the rights and happiness of its people. As a man of the Enlightenment, Washington led a revolution against the Old World and its appalling superstitions, religious bigotry, and intolerance. My presentation for AP U.S. history teachers, titled “George Washington, the Enlightenment, and the Creation of a New Nation,” demonstrates how teachers can frame historical events from 1754-1799 around the life of George Washington. In my opinion, it’s difficult (and almost impossible) to understand the creation of our nation without examining Washington’s remarkable life, a life that ended with a final revolutionary act — the emancipation of his own slaves in his Last Will and Testament. 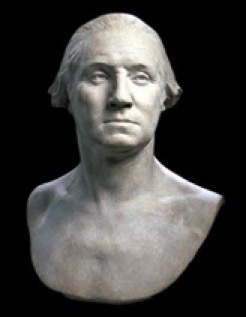 This bust of Washington was created from a life mask made in 1785 by the sculptor Jean-Antoine Houdon. It’s an image of Washington in his early fifties that has been described as one of the most accurate depictions of him in any work of art.